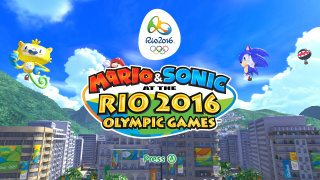 Mario & Sonic at the Rio 2016 Olympic Games is the fifth entry in the Mario & Sonic at the Olympic Games series, released in conjunction with the 2016 Summer Olympics held in Rio, Brazil. It was released for the Wii U and Nintendo 3DS in 2016, with the 3DS version being released first and the Wii U version coming out a few months later. Mario & Sonic at the Rio 2016 Olympic Games has all 21 of the characters playable in previous instalments as well as, for the first time in the series, guest characters that are exclusive to specific events and require unlocking. In the Wii U version, the 21 regulars are playable in all events. In the 3DS version, only Mario, Sonic and Miis are playable in all events, while other regulars are limited to two events and guests are limited to one. Technique: 3 A blue hedgehog with a penchant for high speed, Sonic is a free spirit with a love for adventure. He despises anything that is unfair and will get into trouble to help anyone in need. For Sonic, saving the world is just another thrilling episode in his life. He's currently hoping to turn his innate speed into some quick gold. Technique: 9 Sonic's best friend and trusty sidekick, Tails can use his two tails to fly, allowing him to lend Sonic a helping hand with hard-to-reach places. Tails is also somewhat of a technical genius, applying his mechanical expertise to invent all sorts of vehicles and other robotic contraptions. Undaunted by Sonic's speed, he's determined to use his wits to propel himself to a gold medal. Technique: 6 An over-enthusiastic, but good-natured hedgehog girl with a preference for cute things, sweets, and shopping. Amy's constantly trying to close the gap between her and Sonic, but the Blue Blur is one tough guy to catch. She hopes to spend the Olympic Games enjoying the sights of Rio, and is looking to bring home a gold medal as a souvenir. Technique: 5.5 A red echidna that boasts some serious muscle, Knuckles is what one might call "best frenemies" with Sonic. He's a capable treasure hunter, but his straightforward and trusting nature gets him mixed up with less-scrupulous characters on occasion. He's eager to test his formidable agility and prodigious strength to the fullest in the Olympic Games. Technique: 6.5 A noble princess from another dimension who is also guardian of the Sol Emeralds. Blaze has a kind heart, and always stands up for those who can't stand up for themselves. In addition to being athletic, she also has the power to control flames. After a bit of time away, she's once more crossed over from her dimension in order to rekindle old friendships and test her skills in the Olympic Games. Technique: 4 A black-and-red hedgehog who bears a striking resemblance to Sonic. While Shadow may seem like Sonic's rival, he personally hates for the two of them to be seen together. A stoic perfectionist, Shadow has a great deal of pride in his own exceptional abilities. He hopes the Olympic Games will provide him the ultimate competition - one he has no intention of losing. Technique: 8 This silver hedgehog from the future has a complicated past with Sonic, but has been known to go on world-saving adventures with him. Silver can use his telekinetic powers to move objects or even levitate himself. He has a rather straightforward mindset, loves world peace and blue skies. The true and fair spirit of competition cultivated by the Olympic Games is what drew Silver back from the future. Technique: 9 This evil scientific genius needs no introduction. Dr. Eggman is constantly plotting to fulfill his hopes and ambitions of conquering the world and rebuilding it into his ideal "Eggmanland", but Sonic always manages to stop him. His current madcap scheme is to sweep the medal race, then hijack the competition and turn the Olympic Games into his own Eggman-sponsored affair. Technique: 3.5 This high-performance combat robot was built by Dr. Eggman for the sole purpose of defeating Sonic the Hedgehog. Metal Sonic's metallic frame resembles Sonic, as does his speed, power, and endurance. Like Sonic, Metal Sonic plans to put his exceptional speed to the test at the Olympic Games. Technique: 6.5 This crafty croc leads the Chaotix Detective Agency. Vector may speak in a rough tone and he may not sweat the details, but uses his powers of deduction to solve any case with dignity and respect. Vector is a true leader with dreams of becoming rich, but is perpetually broke since he often takes jobs that help people but don't pay. There's a strong possibility he'll be competing in the Olympic Games on an empty stomach. Technique: 3 Jet is the leader of the Babylon Rogues, and Sonic's rival when it comes to "Extreme Gear" racing. His mastery of the board is so impressive, he's earned himself the name of "Legendary Wind Master". When he's not seeking treasure, he's looking for new speed challenges. The pace and technical skill required in ball sports caught his eye, and he intends to add a few Olympic medals to his collection. Technique: 3 A member of the Babylon Rogues, Wave serves as the team's mechanic as well as strategist. She can't abide anyone she considers less intelligent than herself - which in her mind is pretty much everyone else. Nevertheless, she still admires Jet and serves as his faithful follower. She seems especially fond of Olympic events that involve riding on things. Technique: 8 A sultry bat with an air of mystery who specializes in jewels, Rouge is a brave and seasoned spy who boasts excellent footwork in a fight. Although a treasure hunter by nature, her love for gems can sometimes cause her thieving tendencies to take over. Perhaps she entered the competition in order to get her hands on a shiny and sate her lust for glitter. Technique: 8 This straight-laced detective is the voice of reason in the Chaotix Detective Agency, but his reserved demeanor hides a burning sense of justice and a refusal to let evil have its way. Trained as a ninja, this chameleon is a master of throwing kunai, and can vanish using his Leaf Swirl technique. For Espio, these Olympic Games are merely a step along the path to perfecting his art. Technique: 8 A free-spirited badger who lives on the outskirts of the jungle. Sticks is a bit wild due to her woodland upbringing, but she's a talented hunter who can take down any prey with her trusty boomerang. She's also obsessed with things that glitter, and so has come to Rio after hearing she might be able to win a shiny medal. Technique: 5.5 Zavok is the strongest of the sinister Zeti and the leader of the Deadly Six. As the last disciple of Master Zik, he's a certified force to be reckoned with. Along with his formidable physical prowess, a calm demeanor and penchant for quick-thinking makes him well-suited to leadership. His greatest joy is in improving his skills, which makes the straight-forward competitive nature of the Olympic Games quite appealing. Technique: 3 The wild and crazy member of Dr. Eggman's Deadly Six, Zazz is every bit the metalhead he looks like and and his unruly and unpredictable personality makes him destructive even by Deadly Six standards. He hates boredom above all else, and will fly into a rage when held back from a fight. His competitive style is a bit more chaotic than is usually seen in the Olympic Games. Technique: 5 This cheerful hero is known for his red cap and mustache. He's incredibly athletic, and excels at nearly any sport he tries. He and his brother Luigi are currently competing to see who can win the most Olympic medals. Technique: 7 This green-capped Mario brother is easily scared, but a kind person at heart. Although he often finds himself overshadowed by his older brother, he's actually quite skillful himself. He's come to Rio with the goal of winning more Olympic medals than Mario, who always seems to hog all the attention. Technique: 9 The princess of the Mushroom Kingdom. She's come to the Olympic Games with a bevy of Toads by her side, and is driven to put on a brilliant performance in the name of all the Toads back home who couldn't attend. Technique: 3.5 The peppy princess from Sarasaland is having a blast at the Olympic Games! In her downtime, she plans to chow down at fine restaurants and maybe get a little shopping in with Peach. Technique: 4 This voracious friend of the Mario brothers hails from Yoshi's Island. He uses his long tongue to eat just about anything, but is especially fond of melons and other fruits. He's attending these Olympic Games with a host of colorful friends at his side. Technique: 6 Money, money, money! This scoundrel has taken on all sorts of jobs in his pursuit for cash, including treasure hunter, adventurer, and even president of a game company. His latest scheme involved dominating the Olympic Games with the power of garlic, thus allowing him to hog all the valuable gold medals for himself. Technique: 8 This oddball sports a hat with an upside-down L on the front. Although his distinctively scrawny physique leaves him without much power, he makes up for it with flexibility and athleticism. Despite his seemingly lackadaisical attitude, he actually trains quite hard behind the scenes. Technique: 6 The vicious and egotistical King of the Koopas! He's come to these Olympic Games with a host of seasoned minions in tow, and ordered them to win gold on penalty of fire breath - even though he plans to keep all of them for himself. It's just what any good villain would do. Technique: 5.5 Bowser's prankster of a son. Since Dad spoiled him rotten, he now expects to get his way. Despite his selfishness, he still holds Father in high regard, and wants nothing more than to impress him. Technique: 5 Although this mild-mannered king of the jungle isn't the brightest banana in the bunch, he boasts exceptional strength with which he hopes to dominate the Olympic Games. Since DK and his friends normally live in the jungle, these Olympic Games are perfect for his training regimen. Technique: 8 Although this simian lacks the brute strength of his buddy Donkey Kong, he makes up for it with keen agility and technique. This skill set makes him particularly well-suited for dodging tackles in rugby sevens. Technique: 3 This mysterious creature carries a large sack over its shoulder, and also conducts research about Mario from a base on Secret Island. He's surprisingly fast despite the hefty sack, and hopes to use that speed to full effect in the Olympic Games. Technique: 7 This lone girl among the seven Koopalings has a bullish attitude and always seems angry. She's also very style-conscious - wearing a necklace, bracelets and high heels. Because of her personality, her only focus now is on winning the Olympic Games. Technique: 8 One of Bowser's seven Koopaling henchmen. His unique ruffled mohawk and blue head star give him a flashy appearance. In the Olympic Games, he performs acrobatic movements on horseback to thrill the crowd! Technique: 8 A mysterious woman who travels aboard the Comet Observatory starship. She's taller than Peach and Daisy, and has an air of mystique about her. Having seen past Olympic Games from her observatory, she's finally decided to come enjoy the fun in person. Technique: 3 One of the many Mushroom Kingdom Toads who serve Peach. Many of his fellow Toads are involved with running the Olympic Games, while others are participating in the actual events. Technique: 5.5 Bowser's skeletal form. This bony transformation grants him the agility of lightweight competitors while maintaining his heavyweight power. Only those who've boned up on their skill set can hope to pull off such a humerus technique. Both versions of the game feature amiibo functionality. In the Wii U version, Mario-related amiibo lets the player enter the Mario League, and the Sonic amiibo lets the player enter the Sonic League. All other amiibo will give either coins or rings. The 3DS version, on the other hand, is only compatible with the Mario and Sonic amiibo. Using them will turn the Mario costume into the Gold Mario costume and the Sonic costume into the Super Sonic costume respectively for 24 hours.